Nestable container NESCO 400x300x300 without lid, with bail arms | George Utz Ltd. 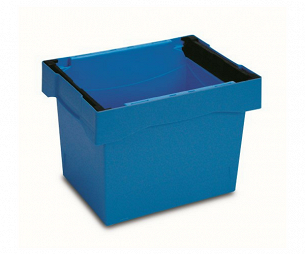 This nestable container, NESCO, with bail arms is in light blue and has the external dimensions 400x300x300 mm. The internal dimensions are 346x264 mm at the top of the container and 313x213 mm at the base. This container is not a standard stock itemand therefore the lead time will vary. For current stock levels and an up to date lead time please contact the office or send an enquiry.